Thanks to the success of the F-5A, an aircraft developed as tne N156F along with the T-38 Talon, there became a need for a dedicated two seat lead-in trainer for those who were going to fly the F-5A and had no T-38s around to use. In fact, the F-5B was very much a T-38 brought up to F-5 standards with the strengthened landing gear, more powerful engines and the capability of carrying under wing ordnance for use in weapons training and just in case another aircraft was needed in an emergency. The aircraft were not armed with cannon, resulting in the room for the second seat and a more pleasing looking aircraft. F-5Bs were built to customer specs and depending on who was going to receive the aircraft, various additions, deletions or other modifications were made to the airframe. The idea was to keep the two seat versions as close to the single seat planes as possible to make it easier for maintenance and spares procurement. The aircraft was a huge hit with many NATO countries, going into initial service with Spain, Norway, and the Netherlands, to name a few. Later, when the planes were replaced, many airframes found their way into the hands of other countries such as Greece and Turkey, many as attrition replacements. Personally, I much prefer the looks of the two seat F-5s as they just seem to be a much more esthetically pleasing looking aircraft. So it was with much delight that I opened the parcel from Classic Airframes containing this review kit. If you have seen the A version, then many of the parts in this kit are pretty much the same. The biggest difference is in the fuselage, which has to be a new tool to incorporate the differences. This one looks very much like the Sword T-38 kit, another very nice looking aircraft. The kit parts themselves are as well molded as on the F-5A and in fact. several of the parts are identical. This probably means that the wheels are a bit too wide as I found with the F-5A and perhaps the resin speed-brake/wheel well insert will be a tad too narrow, but only building will tell for sure. Unlike the A kit, this one has the blanking plate incorporated into the outer exhaust, one of the resin parts. The win g tip tanks are missing the proper 'droop' in the front since the exact same sprues are being used. There are a full set of pylons, most of which have sink marks that will need filled, however, in terms of things to hang under them, there is nothing, only a centerline tank. Sidewinders and rails are provided, but to my knowledge, these were rarely, if ever, carried. Most of my photos of F-5Bs show them with only a centerline tanks and perhaps some of the pylons, used to carry training rounds. I should mention that the resin parts are all shown inside the white rectangle in the image of the sprues. I've also changed the sprue shot to grey scale to make the image less bit intensive. The instructions are basically the same as for the F-5A and are well done. A note explains that the sheet is used for all versions of the F-5 so not all parts may be included with the kit. If things hold true, perhaps the next F-5B boxing will include some bombs and napalm tanks. Markings are for three planes. 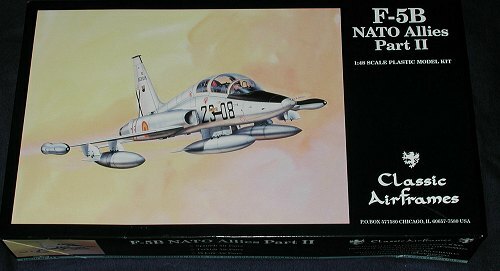 One is the box art Spanish aircraft in overall painted aluminum as first delivered. Next is a Greek F-5B in their greys camo of FS 35237, 36251 and 36307 in a wrap-around scheme. The other is a Turkish F-5B in the SEA scheme of FS 34079, 34102, 30219 over 36622. If you have the references, you'll find both the Greek and Turkish F-5Bs were painted in several other disruptive camo schemes that could easily be used on this kit. Decals include data and wing walk areas where those apply. 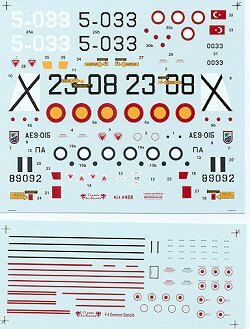 They are printed by Microscale so you KNOW that they are a quality decal sheet. Having built the F-5A, I'm aware of those areas of concern and hope to bypass them on this build. I'm really pleased that we no longer have to resort to the rather basic Fujimi 1/50 kit when we want to add this cool aircraft to our collections. This one is already underway so stay tuned for a full build review in the near future. Classic Airframes goes a long way to listening to what modelers want. This F-5 series just goes to prove that as it has been on my 'want' list for a LONG time. I think we should all support CA so they can continue with their fine work.